Now that Simon Pirani’s book has descended to paperback prices we are in a position to read it. And worth reading it is. Since the fall of the USSR and the opening of state archives we have been promised many new revelations about the dastardly deeds of the leaders of the Russian Communist Party (Bolshevik), to give it its 1918 title. In fact these have been largely banal and unastonishing as (to give but one example) the supposed revelations that Lenin sent instructions to shoot deserters during the war against the Whites were hardly secret before 1990. What has been more revealing and much more interesting for revolutionaries trying to understand how the hopes aroused in 1917 were so quickly dashed has been the work of those historians who pioneered research into how the revolution worked (or didn’t) from below. In this we are indebted now to a long list but Diane Koenker, Mary McAuley, Ronald Suny, William Rosenberg, Donald Raleigh and Steve Smith would be the most obvious trailblazers. Steve Smith was Pirani’s PhD supervisor and his Red Petrograd, along with Alexander Rabinowitch’s The Bolsheviks Come to Power, was the chief inspiration for the CWO when we wrote our booklet 1917 (2). Pirani shares much of the framework of the Communist Left. He agrees that the October Revolution of 1917 was a “defining event” which he views from a “socialist standpoint”. The big and agonising question he wants to explain is why “within months of the October uprising, the revolution was in retreat from the aims of social liberation it had proclaimed”. For him, and for us, socialism (or communism, as for Marx the terms were interchangeable) is based on Marx’s definition of “a movement to recreate society by superceding (sic) alienated labour, private property and the state”. We also have to agree with Pirani that “the early spring of 1921 was a turning point for the Soviet state” as we have previously written precisely this in our article Kronstadt 1921: Beginning of the Counter-revolution (3). To which we would also add that the Third International’s adoption (three months later) of the united front with social democracy was also a retreat on the international stage every bit as serious as that at home. This was in effect an abandonment of a perspective of world revolution. As world revolution was the premise on which the October revolution was based it is not a mere theoretical matter. The primary cause of the failure of the revolution was its isolation. Not a single leading figure of the revolutionary movement in Europe, from Lenin to Luxemburg (as our quote above shows) doubted that the construction of socialism could not be completed in an isolated Russia. Pirani barely acknowledges this (although he is aware of it and accepts it). What he is interested in is not the “why?” of the revolution’s failure but the “how?” and launches into his narrative. And in so doing he does us a service. For revolutionaries the Russian experience, for all its never-tobe- repeated uniqueness, does offer us one of the few chances to study how proletarian power will have to operate (or rather, not to operate). The narrative is compelling. Pirani maintains that the Russian Communist Party (Bolshevik) (RCP (B) or the Bolsheviks as he insists on calling them because many workers still used that term, had a choice at this point with the civil war now over. They could either revive proletarian self-activity or they could further integrate party and state. A social contract evolved, under which workers would maintain discipline and improve labour productivity, and cede real decision-making power to the party - which in return would ensure a consistent improvement in living standards … The aspirations of 1917 to collective, participatory democracy were abandoned, and the for a for working class political activity, the soviets and the unions, allocated restricted functions that involved implementing, rather than making decisions. 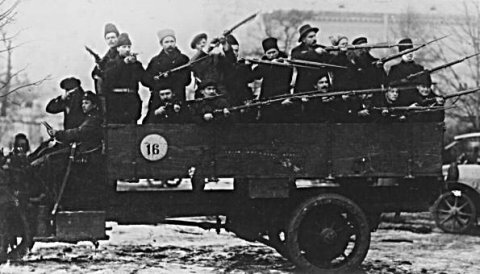 Then, as workers were voting increasingly for non-party candidates in soviet elections (since all other political parties were either banned or not trusted by the workers) by way of protest (the RCP did not win majority in a single large Moscow factory in 1921), the RCP began to change the rules. This was a curiously prescient anticipation of Lenin who realised much the same thing at the Eleventh Party Congress in 1922 .. Revolutionaries can only agree and Pirani’s work is another important piece of the jigsaw allowing us to understand the kind of society we want, and the dangers that we must face up to in order to obtain it. (1) Ulrich von Hutten (1488-1523) was a German humanist and poet who during the Reformation fought for the abolition of princes in the Holy Roman Empire and the secularisation of Church property. (2) Available at £3 from the group address (postage included).